The idea behind this research is to provide an honest comparison for the two popular RDBMSs. 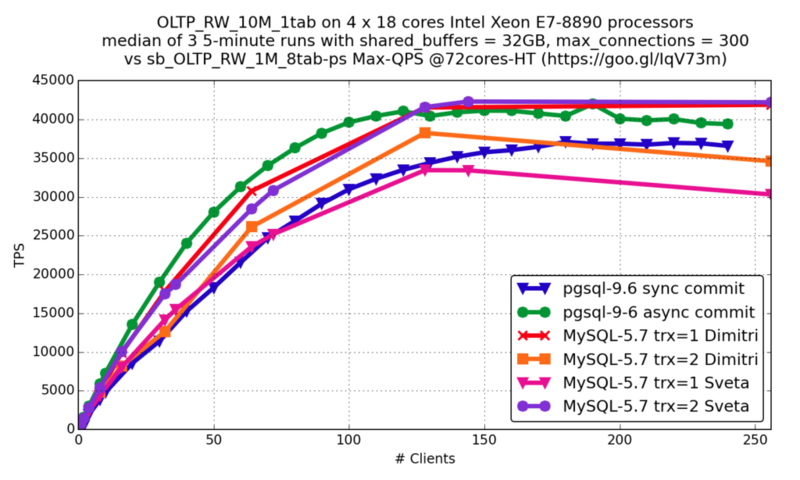 Sveta and Alexander wanted to test the most recent versions of both MySQL and PostgreSQL with the same tool, under the same challenging workloads and using the same configuration parameters (where possible). However, because both PostgreSQL and MySQL ecosystems evolved independently, with standard testing tools (pgbench and SysBench) used for each database, it wasn’t an easy journey. The task fell to database experts with years of hands-on experience. Sveta has worked as a Senior Principal Technical Support Engineer in the Bugs Verification Group of the MySQL Support Group at Oracle for more than eight years, and since 2015 has worked as a Principal Technical Services Engineer at Percona. Alexander Korotkov is a PostgreSQL major contributor, and the developer of a number PostgreSQL features – including the CREATE ACCESS METHOD command, generic WAL interface, lockfree Pin/UnpinBuffer, index-based search for regular expressions and much more. So we have a pretty decent cast for this particular play! Postgres Professional together with Freematiq provided two modern, powerful machines for tests. 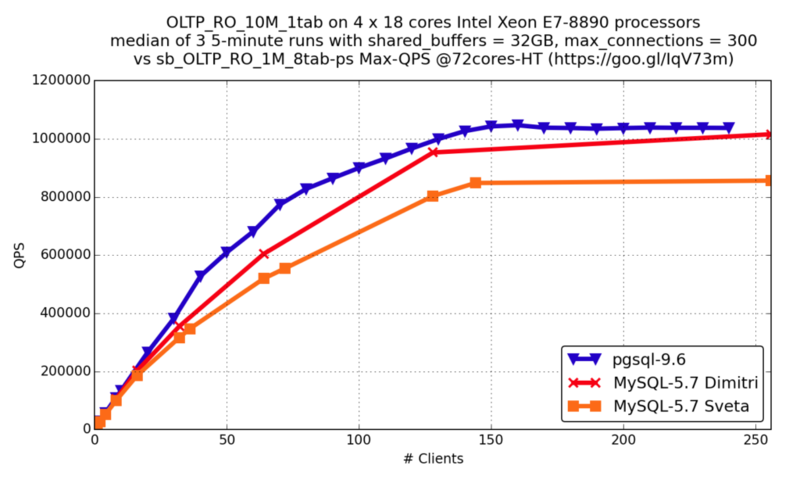 The standard PostgreSQL tool for performance tests is pgbench, while for MySQL it’s SysBench. SysBench supports multiple database drivers and scriptable tests in the Lua programming language, so we decided to use this tool for both databases. I converted pgbench tests into SysBench syntax, and put the tests into an open-database-bench GitHub repository. I should mention that I was not able to get the same results as Dimitri for the Read Only and Point Select tests. They are close, but slightly slower. We need to investigate if this is the result of different hardware, or my lack of performance testing abilities. The results from the Read-Write tests are similar. 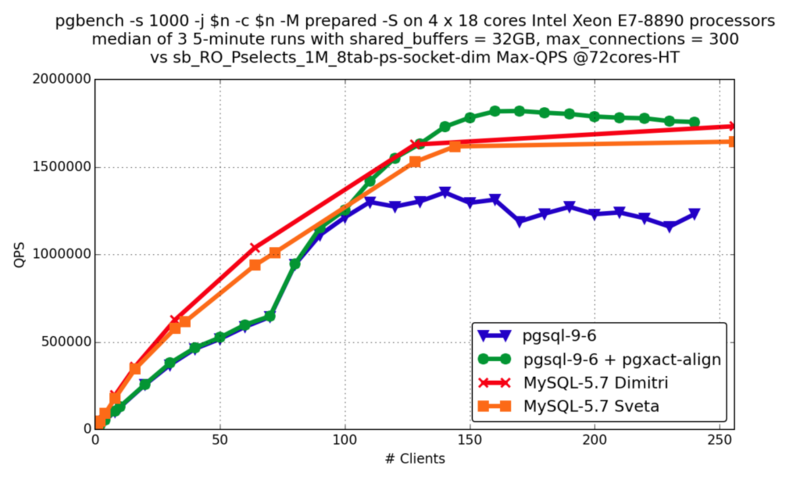 Another difference was between the PostgreSQL and MySQL tests. MySQL users normally have many connections. Setting the value of the variable max_conenctions, and limiting the total number of parallel connections to thousands is not rare nowadays. While not recommended, people use this option even without the thread pool plugin. In real life, most of these connections are sleeping. But there is always a chance they all will get used in cases of increased website activity. For MySQL I tested up to 1024 connections. I used powers of two and multiplies of the number of cores: 1, 2, 4, 8, 16, 32, 36, 64, 72, 128, 144, 256, 512 and 1024 threads. Anastasia: The initial findings of this research were announced at Percona Live Amsterdam 2016. More findings were added to the second version of the same talk given at Moscow HighLoad++ 2016. Hopefully the third iteration of this talk will be available at Percona Live Open Source Database Conference 2017 in Santa Clara. Stay tuned: the Percona Live Committee is working on the program! Stacy (Anastasia Raspopina) works for Percona as a Marketing Specialist responsible for internal company communication, event management, promotional activities, content generation and other special projects. Is it just the price to pay for having to convert sysbench tests to pgbench? > Is it just the price to pay for having to convert sysbench tests to pgbench? I believe number of tables does not much a lot for these tests. It certainly has not effect at all for RO tests for MySQL (I tested). But this is good point and I make sure in the next round of tests we will have same number of tables. You can certainly use tests for these benchmarks. These are standard MySQL tests for now anyway. But you will need to tune Aurora instances differently. That is a good (read: depressing) point. I wonder if we could hack around this by providing a simple script to run that uses EC2/Azure/etc to display the numbers? You did a great job tuning, running and documenting your work. Can you summarize what is in the concurrency_kit sysbench branch? Is prepared statement support in sysbench now? What features do you and Alexey want to add to sysbench? > Can you summarize what is in the concurrency_kit sysbench branch? This branch uses LuaJIT instead of Lua and has scaling improvements. Actually looks like while this post was under review Alexey merged concurrency_kit into upstream. At least this is that commit logs say. > Is prepared statement support in sysbench now? > What features do you and Alexey want to add to sysbench? To be able to continue collaboration with PostgreSQL we need to solve SysBench+PostgreSQL issue. For MySQL I am happy so far. Thank you Anastasia and Sveta. All the credits should go to Sveta, actually. All the tests are hers, my assistance was minor and was mainly about organizational things, intros and such. Thank you for supporting the idea though – hopefully we’ll see more open source databases tested under the umbrella of this project. 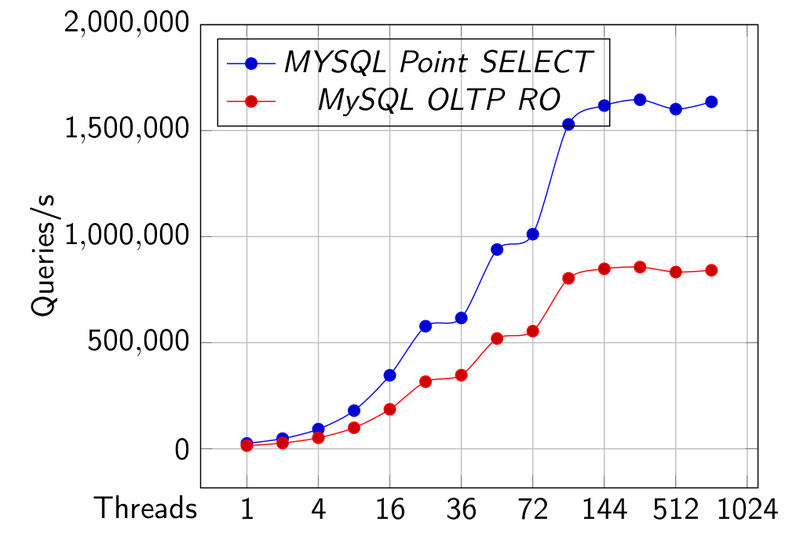 In the graph of “OLTP RW”,why the performance of MySQL-5.7 trx=1 Dimitri is better than MySQL-5.7 trx=2 Dimitri ? 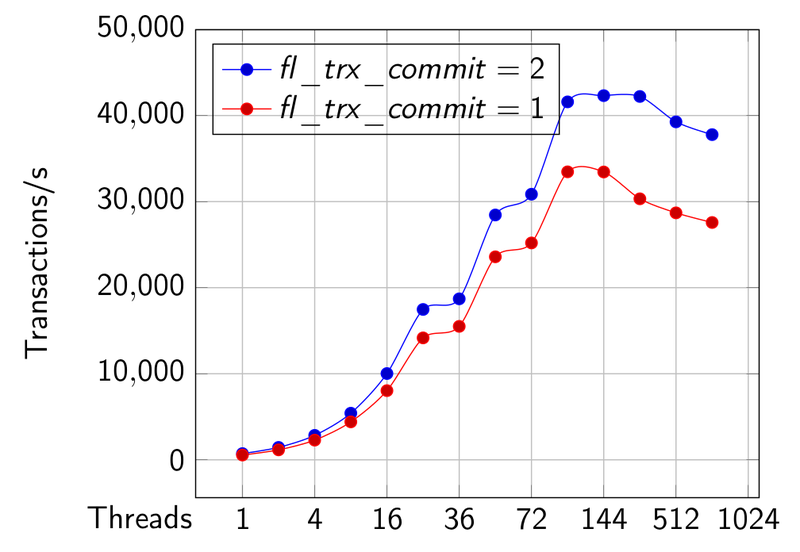 why the the performance of MySQL-5.7 trx=2 Sveta is better than MySQL-5.7 trx=1 Sveta ? Oh, looks like Dimitri’s graphs misplaced! trx=2 Dimitri is certainly faster than trx=1 Dimitri. Thank you for noticing this! I will ask to replace graph with correct one. In any case reason is obvious: with trx=2 flushing occurs once per second while with trx=1 at every transaction. Nice explanation & thanks for sharing.